This brownie recipe includes German Chocolate cake mix, evaporated milk, and so on. You are supposed to make a brownie type mixture, put half in a pan and bake it for eight minutes or so. Then you add caramel, chocolate chips, and the rest of the brownie mixture. I hadn't made it in awhile, and layered everything in the pan at once, forgetting to bake the bottom layer first. As a result, they were much flatter than usual. The rub of it is that I had decided to bake two pans at a time -- so I messed up two whole pans of brownies. They weren't terrible, but they weren't good enough to put in gifts or take anywhere. We're still snacking on them. Mix together cake mix, butter, and 1/3 cup evaporated milk. Pat half of the mixture in the bottom of a greased 9x13 pan. Bake for 8 minutes. While the bottom layer is baking, peel the caramels. Place in a saucepan with 1/3 cup evaporated milk. Heat and stir until all caramels are melted. Remove brownies from oven and sprinkle chocolate chips on top. Drizzle caramel sauce over chocolate chips. 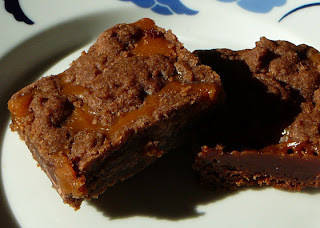 Drop the rest of the brownie mixture in dollops on top of th caramel. I have been meaning to try this recipe for some time now, but I just hate peeling all those caramels. I wish they'd sell it in blocks. I agree with you about unwrapping caramels! But that's what husbands & kids are for! I just saw an article in Cooks Illustrated that claimed that making your own caramel sauce isn't any more time consuming than opening and melting caramels. They are probably right, but I haven't had a lot of luck with making my own caramel sauce. I guess now that they're making caramel bits, I don't have an excuse!